Luca Alessandrelli: Drums They have recently released a cover version of the song "Umbrella" featured as a must listen by Kerrang magazine, and has become very popular. Vanilla Sky is an italian pop-punk outfit from Rome, formed in February 2002. They have recently released a cover version of the song "Umbrella" featured as a must listen by Kerrang magazine, and has become very popular. Their first full length "Waiting for Something", released in 2004 by Wynona Records, sold over 25,000 copies. During the last years, they've played tours all over Europe and Japan, sharing the stage with bands like Nofx, Good Charlotte, the Offspring, the Hives and many more. 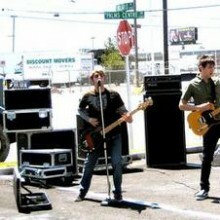 Their new album, called "Changes", has been released in June 2007 by Universal Records. In 2009 Luca (drums) and Cisco (bass) left the band; the new bassist is Antonio Filippelli and the new drummer is Jacopo Volpe. Darling readers if you are reading this, you are on on the page of the recording artist vanilla sky in our eLyricsWorld. Our database comprises with data about 52389 artists worldwide as well as 829824 songs 60 of which are from vanilla sky. Besides the singer's biography, on this page you can see brief information about them, enlists birthdate, genre, label Be conversant with all the facts around vanilla sky by adding RSS feed. If you prefer you could directly visit the address you are on at the moment and check out what's new and latest songs about the artist.